Horizontal volute casing pumps, single-stage, with open multivane impeller, sizes 40-140 and above with bearing bracket, in back pull-out design. Sizes 40-140 and above with replaceable shaft sleeve in the shaft seal area. 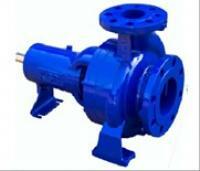 Volute casing with integrally cast pump feet. Pump connections to DIN/EN or ASME. Single- or double acting mechanical seal to EN 12 756.